The traditional retail sector has been facing a turbulent scenario in terms of commercialization & popularity, of late. However, humanoid robot market, with its penetration in brick-and-mortar retail ecosystem, is sending out waves of anticipation for a pronounced change in the merchandizing spectrum. This transformation and inclusion of human like robots in the conventional retail models comes on the heels of the growing popularity of digital sales and e-commerce platforms, which is indeed a wake-up call for the store based retailers. Reportedly, the year 2015 was one of the most difficult periods for the brick and mortar businesses, having encountered over 5000 store closures in the United States. An estimate further validating the growing encroachment of digitization and online platforms in the retail industry claims the digital sales to be double than its present value in the coming decade. Amidst such a backdrop of technology leap, retailers are widely embracing the humanoid robots in their economic model to integrate the digital and physical words, or precisely to sustain their existence in the technologically evolving retail sector. This call to radically transform the conventional retail merchandizing model has indeed led humanoid robot industry to become a vital component of the overall retail sector, with a slew of technology and application endorsements including advanced facial recognition, speech recognition, emotion recognition, and other appreciable machine learning and AI capabilities. The concept of these programmable robots has been quite fascinating at a global scale. According to Global Market Insights, Inc. humanoid robot industry recorded a commendable global shipment of 90,000 units in the year 2016. The proliferating demand for better customer engagement model and the shifting focus of the brands toward experience-based marketing, which is different from models solely based on transactions, are two of the leading factors driving the growth of humanoid robot market. It wouldn’t be wrong to quote that the technology is being ‘personified’ to humanoid robots. In fact, the expanse of these life like robots has been ranging right from greeting and welcoming the customers and goods management to enabling a customized interaction between these robots and their organic counterparts, enhancing the entire retail value chain. Pepper reportedly led to an increase of 10%-30% in the store traffic. Retail next augmented the capture rate by 10%. Taking the trends of past few years as a reference, it is undeniable that robots have revolutionized the offline or physical retail segment, reviving the customer traffic, especially when it was losing the battle against the online platforms. In fact, retail sector is deemed to be the largest opportunistic space for the humanoid robot market, where these human like robots can establish themselves in a variety of roles including the likes of product heroes, clerks, emotion and behavior analyzers, and entertainers. It is still debatable as to which organizational segment would emerge as the beneficiary of this humanoid robot intervention in the retail cosmos. While big shots like Walmart manage to sustain their existence in the digitally evolving space, the ultimate sufferers to bear this loss remain the SMBs, who pay the price of lagging behind in terms of technology and budget. With the intersection of AI, human like robots, IOT, and big data, the retail sector is experiencing a rather renewed model of customer engagement and experience based merchandizing. In this era where the appetite for technological advancement is humongous, both the SMBs as well as large enterprises are brushing up their skills to gain a competitive advantage, both at the microeconomic as well as macroeconomic levels. Speaking of the microeconomic level, the enterprises can leverage these programmable robots to achieve workforce cost reductions, increased throughputs, decreased downtime and enhanced quality. From a macroeconomic point of view, these life like robots can profoundly impact the productivity of the businesses at a worldwide scale. In fact, as per reliable estimates, automation is claimed to raise the global productivity growth by more than 1 percent annually. Looking at these trends, it is rather overt that the growth path of humanoid robot industry in retail will remain synonymous to the digitization drifts in this sector. In fact, retail sector has been claimed as one of the most opportunistic application arenas for human like robot market growth. These programmable robots endorsed with AI capabilities are allowing retailers to add a new dynamism to their customer interactions, by leveraging human like robots to optimize product assortments and customer intelligence. A lot of companies, it has been observed, has taken the adoption of these life like robots as a resort to enhance and improve their customer engagement and interaction approaches. This list not only comprises the big shots but also the SMBs which are striving hard to battle the gigantic dominance of e-commerce platforms. Some of the renowned companies which have made a remarkable contribution to the humanoid robot market space include Softbank Robotics, DST Robot, Robotis, Blue Frog Robotics, Engineered Arts, Ubtech Robotics, Trossen Robotics, Honda, Toshiba, Hanson Robotics Ltd., and Hajime Research Institute, Ltd.
Softbank Robotics – The company is rightly touted as one of the most influential names in the global humanoid robot market space having made a remarkable contribution to this sphere for over a decade now. The Japanese giant designed its first robot NAO, in the year 2006 which created quite a buzz in the fields of research and education. Reportedly, more than 10,000 units of this first programmable robot by the humanoid robot industry behemoth has been sold worldwide. Post its first discovery, Softbank Robotics, in the year 2009, launched Romeo project, in collaboration with research institutions and laboratories. This human like robot was designed with an aim to assist elderly people who were losing their autonomy. The third and so far, the most remarkable contribution of Softbank Robotics to the humanoid robot market space is the launch of ‘Pepper’, which has successfully broken the robot stereotype, by becoming almost a replica of its organic counterparts. This life like robot, driven by artificial intelligence capabilities, is one of the best examples to portray the intervention of robotic technology in driving the customer engagement and interaction approach. As claimed by the Japanese human like robot industry giant, the robot can not only chat with the customers, but can also perform behavior and emotional analysis by recognizing human emotions. The success story of Pepper can further be detailed by its recorded aid in improving the overall productivity of the companies. For Instance, at a pilot organized at B8ta in the United States, the retail store encountered an increase of 70% in the footfalls. In Japan, the growth of Pepper has been commendable, with more than 7000 of these programmable robots having been deployed in the houses, ever since their inception in 2015. Renowned clients like Nestle and Nissan have well endorsed the breakthrough journey of pepper with regard to impacting the value chain model of the firms. As reported by Nestle, after deploying 1000 Pepper robots for providing advices at sales point, an increase of 15% was recorded in the sales. In yet another trial, Nissan claimed an 18% increase in customer visits, post the introduction of 100 Pepper robots in the company. Toshiba – With the introduction of its life-like robot, Aiko Chihira, the Japanese multinational conglomerate, joined the race of the big shots that believed in the power of technology to change the customer engagement and interactions. Aiko Chihira, the first human like (female like) robot by Toshiba, has been programmed with human like expressions, made its first retail debut in 2015, having been quite popular at events and exhibitions initially. The prototype was initially designed by the company for healthcare and welfare domains. However, the deployment of this human like robot at Mitsukoshi department store in Nihonbashi, Japan remarkably generated quite a buzz among the consumers and surged the tech credentials of the outlet. In fact, as quoted by Toshiba, the company visions of replacing certain sales staff with these programmable robots in the long run. The notion reportedly revolves around the idea of reducing the time spent on basic tasks by the sales staff, and the potential of intelligent robots in executing these chores and add to the entire value chain. Hanson Robotics – This Hong Kong based robotics technology company has in true sense revolutionized the human-technology relationship, with the launch of Sophia – the first ever humanoid robot to have been granted a legal citizenship. Reportedly, this programmable robot which was launched two years ago with a human-like head and face, has lately been given a pair of mechanical legs. Sophia, as per reliable reports, can stimulate 60 varied facial expressions, recognize faces, and hold conversations. This life like robot is anticipated to generate a substantial momentum in humanoid robot industry space, particularly from its applications in the fields of hospitality and healthcare. It is also imperative to mention that the citizenship grant by Saudi Arabia to Sophia has been a subject of debate lately, with regard to how submerging the robots completely with the humans might lead to a destructive scenario, rather than benefiting the nation. However, the impact of this life like robot is worth watching in MEA humanoid robot industry, which as per industry experts, will record a CAGR of 30% in the coming seven years. It is true that automation and robotic technology can very well be perceived as global phenomenon, however, the prevalence of these technologies and their consequent growth paths are to a large extent dependent on the regional landscape. As per estimates, automation technology has attained an appreciable maturity in China, Japan, India, and the U.S., with these four economies accounting for over two-third workforce that are convertible to automated technology. Statistics claim that worldwide over 1.1 billion employees and above USD 15 trillion in wages fall under the category of automatable activities. Out of this, China and India reportedly account for the largest automatable employment scope, courtesy – their size of labor forces. It is also imperative to mention that the sectors mix would also play a crucial role in defining the technology potential of the countries. Speaking along similar lines, industries such as agriculture and manufacturing comprise of humongous physical activities which have a very high potential to be automated. 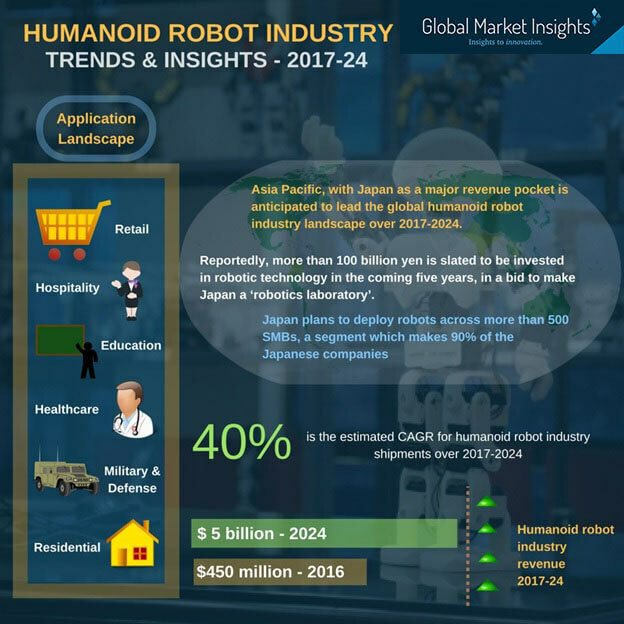 In fact, as per a report collated by Global Market Insights, Inc. Asia Pacific humanoid robot industry will dominate the global landscape in terms of revenue over the coming seven years, driven by enormous potential of this region to deploy these human like robots in a myriad range of industrial disciplines. Japan has been one of the most pronounced regions which has a proper plan in place to boost robotic technology integration. The drive comes in response to a visibly low hourly productivity in the regional services, when it is compared against the other world powers. Not to mention, the labor demands, geriatric population, and economic conditions of the country have also played their cards in boosting the deployment of life like robots in Japan. As per reliable estimates, more than 100 billion yen is slated to be invested in robotic technology in the coming five years, in a bid to make Japan a ‘robotics laboratory’. In fact, the country’s government anticipates increasing the robotics industry fourfold and attain an annual increase in productivity of about 2% by 2020. The nation further plans to deploy robots across more than 500 SMBs, a segment which makes 90% of the Japanese companies. These would include the development of human like robots at a wide scale, expanding the applications of humanoid robot industry across retail, agriculture, nursing, and healthcare. Add to it, the efforts by the Japanese companies such as Softbank Robotics, is vivid enough to portray the humongous growth opportunities lying ahead of Japan humanoid robot industry. However, despite having such a proven expanse of applications across a myriad range of sectors, humanoid robot industry is yet to explore its fullest potential. A systematic environment in place in one of the vital prerequisites for the programmable robot market progression. The integration of these life like robots is largely dependent on their acceptance and the way they are proclaimed and perceived pertaining to their anticipated involvement in the entire process across the industrial as well as residential arenas. However, it is undeniable that the ecosystem is no longer indifferent to the influx of these human like robots, giving a hint of how the humanoid robot market will soon be a major quotient of the global business landscape. A report put forth by Global Market Insights, Inc. claims the worldwide humanoid robot industry share to witness a CAGR of 40% over 2017-2024.